This Herbed Cauliflower 'Rice' with Tahini Yoghurt is sooo easy to make and so tasty. Suitable for Gluten-Free diets. 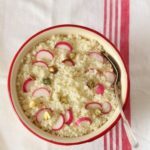 I have been making cauliflower couscous and cauliflower rice recipes a lot recently. It is cauliflower rice when the bits are larger (rice sized) or cauliflower couscous when smaller (AKA couscous size). Most of the time it falls somewhere between the two so the name depends on which I call it first. But for today it is cauliflower rice. 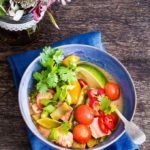 What I like about this is that it is quick, easy, gluten free and low on carbs. So whenever I over indulge, I fall back to eating this cauliflower rice for a few days with whatever left over’s I have in the fridge and everything is all right with the world again. Plus it hits a lot of the diets out there including the 5:2 diet, paleo diet and a low points side dish on the weightwatchers diet. This one has definitely put me in the good books of a lot of friends. Before I share the cauliflower rice recipe here are a few tips for getting the best out of your final dish. My personal preference is to eat this rice with the ‘drier’ sauces so as not to end up with a liquid logged rice dish. Basically, don’t pour a casserole over it. You can steam the cauliflower rice with a little bit of water in the pot – But I prefer the drier taste of frying it which also removed the likelihood of ending up with ‘soggy’ rice. You can even fry it without the oil in a non stick frying pan. Cauliflower has a subtle flavour which means it carry other flavours very well. A quick easy way to add flavour to this is to squeeze on some lemon or orange juice. Now go try this cauliflower rice yourself and enjoy every single mouthful. Believe it or not, this cauliflower rice (without the tahini yoghurt) goes well with my easy chilli chicken recipe and this delectable Instant Pot Lamb Shoulder. This is my second post in a pantry staple spotlight on cauliflower. 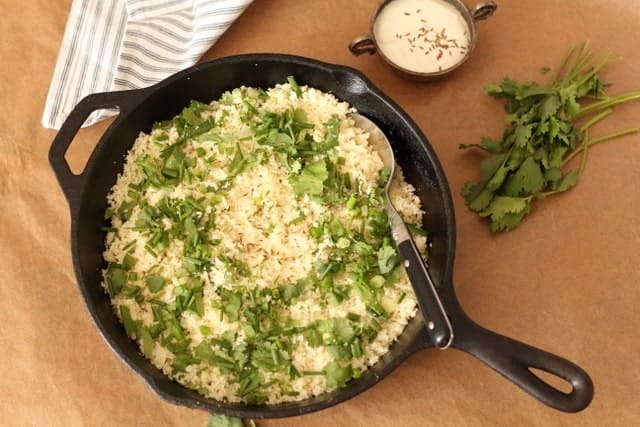 See this post on how to make cauliflower couscous. Don't forget to tag #recipesfromapantry on Instagram or Twitter if you try Herbed Cauliflower Rice with Tahini Yoghurt! It is really, really awesome for me when you make one of my recipes and I'd love to see it. You can also share it on my Facebook page. Please pin this recipe to Pinterest too! Thank you for reading Recipes from a Pantry. 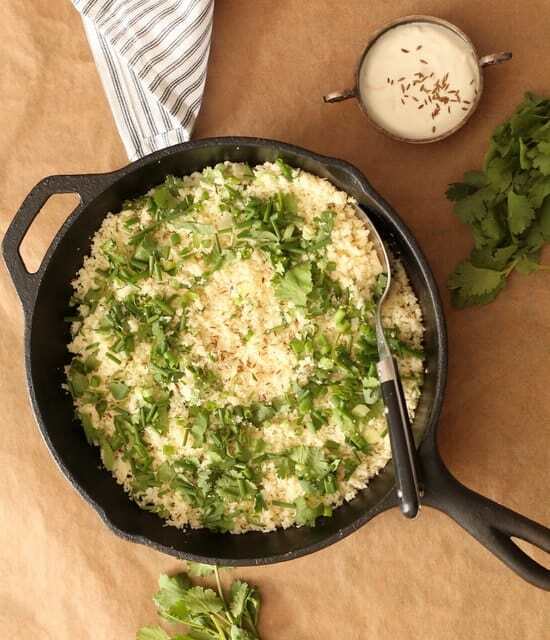 This cauliflower rice is quick, easy, gluten free and low on carbs. Add cauliflower chunks into the food processor and process until they are rice sized. You might need to do this in 2 or 3 batches. Don't over process as you don't want the cauliflower to turn into puree. Heat 1 tbsp of oil in a large frying pan and add the cauliflower. Stir fry the cauliflower rice for a few mins until it cooks to your taste. You might need to do this in 2 batches adding more oil to the frying pan between each batch. I like when it starts to get slightly golden brown but still has a bit of crunch to it. Watch it carefully as the cauliflower can burn very quickly. Take the rice off the hob and stir in the herbs. Make the tahini sauce by mixing all the ingredients together and serve on the side for people to help themselves. You may need to add a tbsp of water if using thick strained yoghurt. This goes very well which some grilled fish or grilled summer vegetables. Feel free to grate the cauliflower if you don't want to use a food processor. If using a food processor, don't over-process the cauliflower. 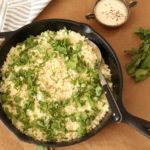 This cauliflower rice is such a great idea, and looks so good! I am quite chuffed with being able to make this. 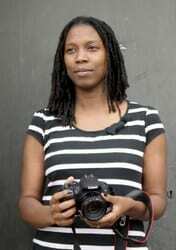 That sounds so tasty Bintu. I don’t make rice enough really. This is a brilliant recipe. Thank you so much. 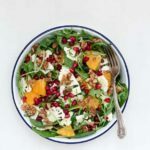 I’ve been trying to find something Gluten free for a few friends when they come round for dinner and it will be nice to give them something different. I am pleased to be able to help Sisley. Do try the cauliflower couscous as well. I am so unadventurous when it comes to food. I’m not a fan of cauliflower personally but I do find your blog very inspiring. Perhaps it’s finally time that I started playing in the kitchen. I am certainly very happy to inspire you to have fun in the kitchen. Shout with any questions. I have made cauli rice before but didn’t even think of putting tahini with it. Sounds delicious. Cauliflower is made for carrying flavours. 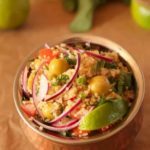 This looks wonderful – I am probably the last person in London who has NOT tried cauliflower rice 😉 time to change that! So excited to make this!!! I love roast cauliflower and this is interesting because I have never tried tahini in yoghurt which I imagine makes for a lighter dish. This looks delicious. Lots of lovely flavours, I love herbs in everything. Yum, I can almost taste this now – love your mix of fresh herbs, spices, yoghurt and tahini! I think I’ll serve this alongside a nice fillet of fish or maybe just eat it all up by itself!